9 bedrooms + 2 extra rooms can be added, golf, cinema, spa, tennis, you name it. Lawson Lodge Country Estate is one of the best holiday houses in Australia, and the perfect country retreat for a group getaway. With stunning accommodation plus unrivalled facilities all included in the rate such as your own private golf course, movie cinema, 8 seat spa, fishing lake, tennis, basketball, petanque and billiards - it offers private groups so much more than other venues. The Lodge has nine beautifully appointed bedrooms with 3 king rooms (all can be 2 singles also), 5 queen rooms, and 4 singles in the loft. All serviced by four charming bathrooms or ensuites, with the claw feet bath tub most popular. The spacious living areas are all stylishly furnished, where modern luxury meets old world class! Plus for the larger groups there are 2 additional Executive Bedrooms alongside the Club House that can be added to your booking (King beds with ensuites). Note we only take one group at a time so if you don't need these rooms we lock them off and don't sell them to anyone else - you don't have to share with strangers and still have complete privacy. 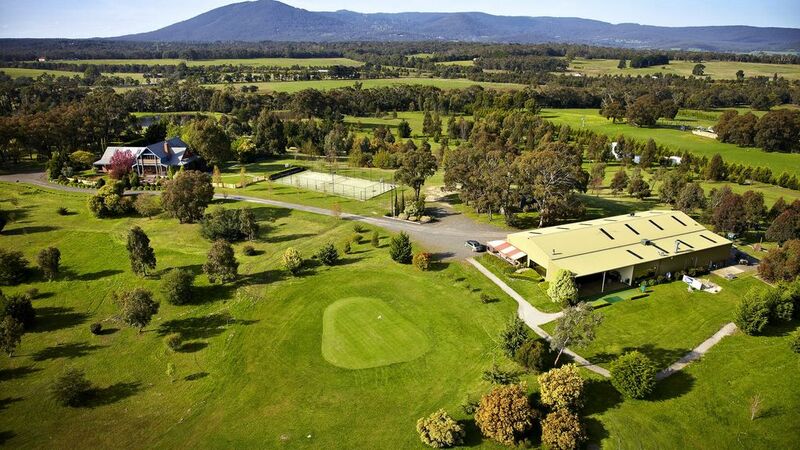 The private 9-hole Golf Course is just for you and your guests when you book Lawson Lodge Country Estate (listed in 50 great resort courses in Australia). The Club House features a Sports Bar with wood fire, billiard table and an abundance of sporting memorabilia; plus the 35 seat Cinema for movies. The Lake has redfin for fishing, with a quaint fishing hut and jetty to fish from. The 8 seat heated spa is in a private indoor gazebo with its own TV, fireplace and sitting area. Plus there is a tennis and basketball court, petanque, bush walking tracks, and board games. All these facilities are included at no extra cost! Located only 45 minutes drive from the CBD or 30 minutes from Melbourne Airport, a two minute drive from the Macedon off ramp of the Calder Freeway. Lawson Lodge Country Estate backs on to the National Park and has amazing panoramic views of Mount Macedon. And when you book Lawson Lodge for a group it is all yours, so you don't have to share with strangers. Indoor dining area seats around 40. Outdoor alfresco area seats around 40. Beautiful property for our amazing wedding! We enjoyed 4 days at Lawson Lodge celebrating our amazing wedding with friends and family. The house was so comfortable with so much space! We all felt right at home, everything we needed was right there. The property was full of natural beauty and charm. Getting married in the Rose Garden and then enjoying our reception overlooking the lake, with kangaroos hopping across the paddocks was just so special. An experience we'll never forget, thank you! Thanks so much Esther and Quentin, I am glad you had a great time. It was a pleasure meeting you both. Cheers. We stayed at Lawson Lodge for a long weekend with 18 friends. Everyone loved it. So many fun activities and beautiful surrounds. House was really nice and beds comfortable. We hope to visit again in the future. That's fabulous Lauren, I am glad you all had a great time. See you again in the future. The Property was fantastic. Incredibly clean, spacious and very well presented. It had 9 bedrooms that easily accommodated our group of 18 people. All appliances were modern and in excellent condition. Everything from tea, coffee to cleaning supplies were all provided. The sports club was very impressive. It was very well stocked with everything you need. Cinema in the sports bar was a big hit with the kids. The golf course was super. Very challenging though. Tennis court and the basketball court give you plenty of things to do. Moreover, all sporting gear was supplied too. So many things to keep you occupied. Wish we could stay for few more days to take full advantage of what was on offer. Chris is a very generous man who was very accommodative and contactable all the time. The bond was returned promptly. Strongly recommend this property to anyone. Actually, it is a mini heaven for all sports lovers. Thank you so much. We will definitely be back. Thanks for your kind words Nishan, it was great meeting you and your family. We hope to see you all again next Summer. My golf and tennis loving dad had the best 70th birthday weekend here with loads of room for us kids and his grandkids. The grandkids had so much to do! Golf, tennis, pétanque, fishing and pool. And they LOVED the cinema and spa gazebo. Fabulous venue, Chris was very helpful and super friendly. We'll be back for sure. Thanks Leanne, it was a pleasure meeting your lovely family and I am glad the kids had so much fun. Had a beautiful weekend with friends, enjoying the fresh country air, relaxing by the fire's in the club house or at the house. Beautifully maintained property with lovely staff to all help make your stay very enjoyable. Proximity to the city makes this getaway easy to get to!! Thanks Lauren, I am glad you and your family had a great time. We hope to see you again in the future. After plenty of searching we decided to have our wedding at Lawsons Lodge in March 2012. The property from every angle you view is stunning (perfect for an array of wedding photos). The staff made us feel very welcome and relaxed and our day ran with ease. We will forever be grateful to Chris and the team for making our day so perfect! A huge thank you to you all!!! !